There are challenges every season during pregnancy but summer, with temperatures rising and holidays on the horizon, is the hardest time of year to manage – sartorially speaking – when you’re growing a baby. It’s a few years since I was pregnant and seeing through the warmer months with a bump but I remember it well and I thought it about time I shared some top tips on managing the summer in style with a baby on board. Even if you usually live in jeans, you won’t be able to deny the pure joy mid-summer at stepping out in a flowing maxi dress on a warm day. To keep some form to your shape look for an empire line (with a seam under the bust) to flatter your figure while keeping cool. 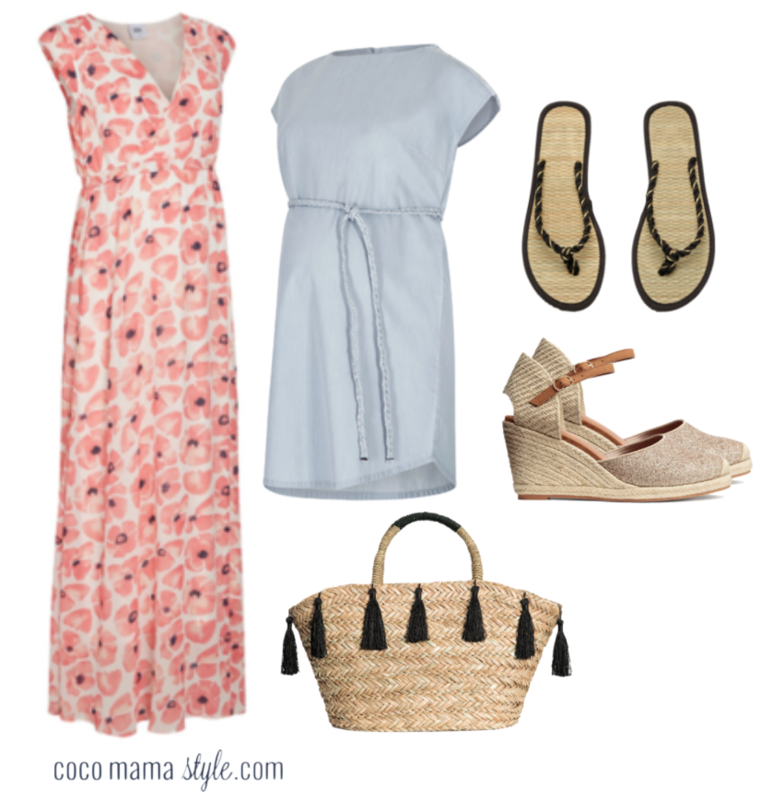 Just add on-trend espadrilles or flip-flops for added comfort to accommodate swollen feet. If you’re on baby number two, three (or more!) and a full length frock isn’t feeling practical with tots in tow, try a loose boho tunic dress that’s easy to move around in, won’t get in the way and any creases will blend right in. The idea of slipping into swimwear may leave you hot and bothered at the best of times, let alone while pregnant but if you’re jetting off to the sun or heading to your local Lido, don’t be afraid to show some skin. One of the best things about pregnancy – you know, apart from creating a new life! – is the freedom it gives you to experiment with your new shape. Be bold with print colour and try new shapes because when else will we not fret about flashing a big tum on the beach! Support is crucial when building the foundations of your maternity wardrobe and as your body changes, you may need that extra lift and comfort. Look for maternity vests and dresses with built-in support around the bust area and of course a well-fitting bra is vital at any time and even more so during pregnancy. Look for cotton-lined cups for cooling comfort. Many of us are more confident in experimenting with colour in summer and with a new shape to show off, what better excuse to don those brighter tones. Bold colours are ideal at this time of year so even if you’re feeling the heat on the inside and want to hide away, don’t try and blend into the background by filling your wardrobe with black maternity clothes, because a splash of colour will simply boost your mum-to-be glow. Choose cool, natural-based fabrics throughout the summer months to ensure that you’re comfortable and not too restricted. Investing in some key pieces that you will wear and wear is a great idea, as linen, cotton or even cashmere mix knits for cooler nights will help to keep you cool and calm. And a bonus tip, just for you! Treat yourself! There will be plenty of gifts for baby heading your way over the next few months and after the birth so don’t feel guilty about treating yourself to a stylish maternity wardrobe. Use this Mothercare voucher code on something other than baby clothes and stay comfortable, cool and chic this summer.